At Denver Comic Con this past June, I was walking the show floor with my buddy Illya, and he introduced me to an amazing artist named Nicky Soh. Illya knows Nicky pretty well, so as they talked, I admired Nicky’s work. 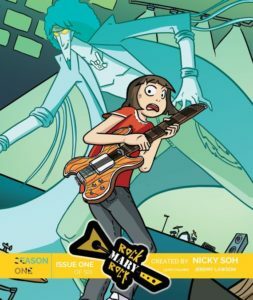 As we left and said our farewells, Nicky handed me the first four issues of his independent comic Rock Mary Rock! Rock Mary Rock has an interesting concept. A girl, helping her grandmother at an old theater, stumbles upon some old instruments in the basement, including a very cool looking guitar. She touches the guitar and unleashes the spirit of a dead rock star that was one of the greatest guitar players the world has even known! I only read the first four issues, so I have yet to get the guitarist’s full back story. BUT here’s the cool part, when Mary touches a guitar, the rocker, Rock Maxel, can control Mary’s fingers, allowing her to play the guitar like a champ! As you can imagine, this makes for some unique plot concepts such as killing it at her school’s guitar club (I didn’t even know those existed), and competing on a guitar reality show. The art is also very clean and fun. Big panels and bold colors give the book a sort of Scott Pilgrim feel with slightly more constraint. The issues are short, so if you decide to pick up the story, get a few; I know I hate it when I pick up a new singe issue, get home, read it, and wish for more right away. If this book looks interesting to you, you will like it, so pick up some issues. And you can find Nicky on Twitter @nickysoh07 and Instagram at nickysoh. As convention season begins to close, I encourage all of you to get out there, spend time at artist alley, and support local comics, artists, and art. Artists work very hard at what they do, and the hustle is real. When I take my students to conventions, I always encourage them to head over to artist alley and make a few new friends!